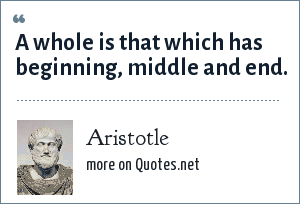 Aristotle: A whole is that which has beginning, middle and end. Aristotle was an ancient Greek philosopher and scientist born in the city of Stagira, Chalkidiki, in the north of Classical Greece. "Aristotle Quotes." Quotes.net. STANDS4 LLC, 2019. Web. 25 Apr. 2019. <https://www.quotes.net/quote/1880>.